At the beginning of January, Canada’s Next Top Ad Exec, the largest marketing competition in the country, put out a call to marketing students, asking: How would they establish Microsoft as a leader in artificial intelligence among post-secondary students? Students had only a few weeks to come up with an elevator pitch. The teams with the top 25 ideas would win $1,000 each and be asked to submit a full, 15-page marketing strategy. Of those, the top 10 teams would have a chance to present their ideas and rub elbows with industry professionals at an exclusive event in Toronto. The winning team would get $25,000. Teams from 28 universities – 184 teams in total – submitted their ideas. Ricky Liu, a business administration student at Wilfrid Laurier University’s Lazaridis School of Business and Economics, and his teammate, Lily Liu, an accounting and finance student from the University of Waterloo, won $1,000 for their pitch and were selected as one of the top 10 teams to present to more than 20 senior leaders, including CEOs and CMOs, in Toronto on April 1. The competition, in its 13th year, aims to bridge the gap between industry and academia by exchanging expertise, mentorship and career opportunities. For students, it’s an opportunity to apply what they’ve learned in the classroom to real-world problems. For companies, it’s become a way to find and recruit the next generation of talent; many executives come to the competition ready to offer internships and full-time jobs to promising up-and-comers. Ricky and Lily worked for months on their pitch. They surveyed more than 130 students and found that, for more than 80% of respondents, communicating across cultures and languages is an area they particularly struggle with. It was also something both Ricky and Lily had faced themselves. Lily had gone on exchange to Sweden in 2017 and Ricky was on exchange in Hong Kong during the three months the two worked on their marketing strategy. Rather than trying to design technology to solve the problem, such as a Star Trek-esque universal translator, their task was to market an idea in an innovative and creative way, using market research. They used the skills they had learned in the classroom to prepare a budget, feasibility report and promotional strategies. The finalists were invited to Toronto in advance of their presentations for four days of workshops and presentations from industry professionals and former competition winners. Ricky and Lily even met with staff from Microsoft and received feedback and suggestions on their idea, which they were able to incorporate into their presentation. 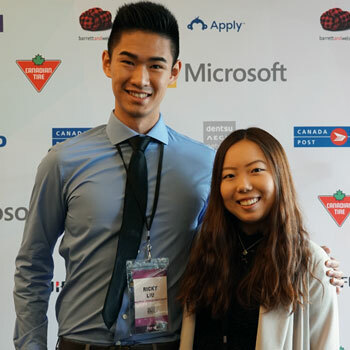 While they didn’t claim the top prize, Ricky and Lily were thrilled to have been involved in the competition and are encouraging other Laurier marketing students to get involved next year. Both are graduating this year and have full-time jobs in their chosen fields lined up.